On 29 March 2017, the British Prime Minister, Theresa May, wrote officially to the EU that the UK has the intention to terminate its EU membership.1 This announcement is the starting point for upcoming negotiations between the UK and the EU. New trade deals for the UK will be an important part of the negotiations, not only with the EU but also with the rest of the world. The letter from the Prime Minister indicates that for the UK government, the principles of Brexit are as outlined in the White Paper of 2 February 2017, which states that the UK aims to “forge a new strategic partnership with the EU, including a wide reaching, bold and ambitious free trade agreement...” and that “we will forge ambitious free trade relationships across the world” (HM Government 2017: 8). From an international trade perspective, the choice of the UK to leave the EU is remarkable. Leaving a large free trade area like the EU will most likely be trade- and welfare-reducing for the UK. Without a new trade agreement, relative trade barriers will change such that trade with the EU will become relatively more expensive, resulting in trade diversion away from the EU and trade creation with the non-EU world. The balance between these developments will most likely be trade- and welfare-reducing, as trade barriers between the UK and the EU – the largest trading block in the world – increase. This gloomy evaluation is corroborated by almost all trade analyses of Brexit. The estimates range between roughly a 1.5% reduction in GDP to more than 7%, depending on the assumptions made on how Brexit will take shape (see Baldwin 2016 for an overview). Only ‘Economists for Brexit’ have produced a positive estimate, but this is a clear outlier in the available estimates (see Miles 2016 for a survey). The need to strike new trade deals for the UK seems obvious. This begs the question: what kind of trade deal? Does the UK really has a viable alternative to its current membership of the EU, like the ‘Global Britain’ strategy advocated by the May government? A few options come to mind when considering this issue, such as a US-UK trade partnership or a trade deal with all non-EU countries. On a more pessimistic note, one could not look at Brexit in isolation but also consider the consequences of the present anti-trade or anti-EU sentiments, such as a collapse of the EU following a possible ‘Frexit’, or even the most extreme anti-globalisation scenario, a total collapse of all trade agreements, and analyse how a Brexit scenario would play out if the overall international trade climate (further) worsens. The benchmark for the alternative scenarios is Brexit itself. The trade effects on the global economy in the case of a hard Brexit – that is, the UK leaves the EU and all trade agreements that the EU has with the rest of the world – are depicted in Figure 1. 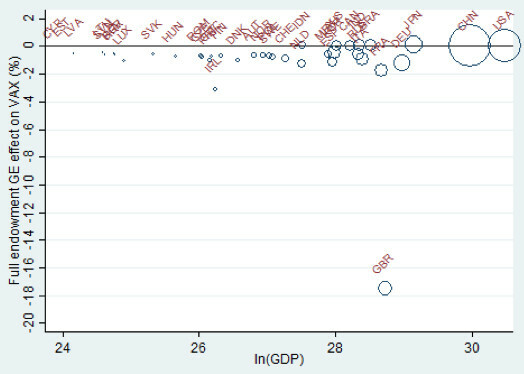 On the horizontal axis, countries are ranked according to their GDP per capita, and on the vertical axis the percentage change in value-added exports (VAX). 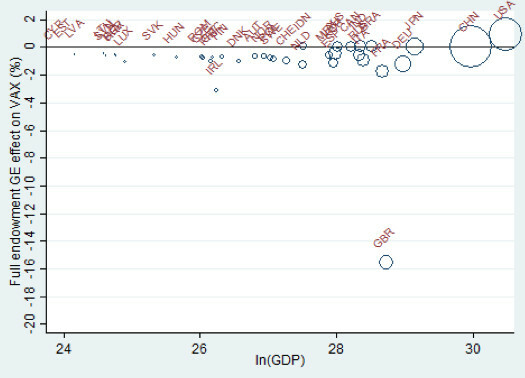 Note: Bubbles are proportional to countries’ value-added exports in 2014. As Figure 1 shows, a hard Brexit scenario has a strong negative impact on the value-added exports of the UK, decreasing these exports by almost 18%, mainly because trade with the (remainder of the) EU becomes more expensive. So what about the alternatives, such as a US-UK trade deal or a trade deal between the UK and the rest of the world? Figures 2 and 3 give the answer. The main effect of the trade agreement between the UK and the US is that it increases the value-added exports for both countries by approximately 2%. For the UK, this implies that the negative impact of Brexit is only marginally offset by a bilateral trade agreement with the US (compare the -18% in Figure 1 with the -16% in Figure 2). Easier access to the US market compensates the trade loss of Brexit to some extent, but within the logic of the gravity model the US is further away and thereby less attractive and relevant as a trade partner. 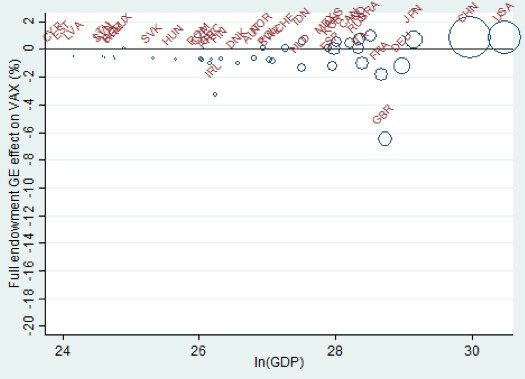 Note: Bubbles proportional to countries’ value-added exports in 2014. What happens if the UK goes for a hard Brexit but at the same time manages to strike a trade agreement with all other countries outside the EU in our sample? As Figure 3 shows, this scenario would indeed provide a boost for the value-added exports of the UK and many other countries. For the UK, it is still the case that the impact of a combination of hard Brexit with a true Global Britain scenario is negative to the extent that its value-added exports fall by more than 6%. The main reason is distance – although the ‘rest of the world’ is large, it is also distant to the UK, not just in the sense of actual distance (compared to the EU) but also with respect to cultural, institutional, legal, and other differences that act as impediments to trade. The net effect of more access to the rest of the world and a hard Brexit is such that it is hard to see how Global Britain can be a viable alternative to or substitute for the UK’s current EU membership. Figures 2 and 3 still describe relatively optimistic scenarios, where it is possible to negotiate new trade deals. However, it is not impossible that the Brexit will be part of larger anti-EU wave that possibly results in the dissolution of the EU itself. Many current national elections offer voters the option to cast an anti-EU vote. In some EU countries, these parties are popular, increasing the likelihood of another exit. The trade effects of such an extreme situation are much more dramatic than those depicted in Figure 1; it is not only the UK that would experience a significant reduction of international trade, but all other countries as well (see Brakman et al. 2017 for these additional scenarios). The UK government states that it is aiming to replace the UK’s membership of the EU by other, broad trade agreements. However, at this stage it is not clear what these new trade agreements will look like and which countries could be involved. What are the alternatives for the UK government? A US-UK trade deal? A more extreme worldwide trade deal? If the UK government aims to compensate for the large negative trade shock of Brexit, the options seem limited. Based on existing empirical evidence on trade agreements, our conclusion is simple. If the UK wants to limit the negative trade effects of Brexit, the UK has no trade-enhancing alternative to an agreement with the EU that essentially mimics the situation in which the UK is a member of the EU. Baldwin, R E (ed.) (2016) Brexit Beckons: Thinking ahead by Leading Economists, CEPR Press. Brakman, S, H Garretsen, and T Kohl (2017), “Consequences of Brexit and Options for a ‘Global Britain”, CESifo Working Paper No. 6448. Dhingra, S, H Huang, G Ottaviano, J-P Pessoa, T Sampson, and J Van Reenen (2017), “The Costs and Benefits of Leaving the EU: Trade Effects”, CEP Discussion Paper No. 1478. HM Government (2017), The United Kingdom’s exit from and new partnership with the European Union. Miles, D (2016), “Brexit Realism: What Economists know about costs and voter motives,” in R E Baldwin (ed. ), Brexit Beckons: Thinking ahead by Leading Economists, CEPR Press. This underestimates the possible effects of a Brexit as we do not include long-term effects on innovation, productivity, or migration (Dhingra et al. 2017). We use ‘value-added exports’ (VAX) because changes in value-added trade are more directly linked to the income and welfare of the countries involved than gross exports; these data also include domestic (non-tradable) services that are used in the production of tradable goods.